The death of Mehrdad II in 88 BC after such a long and successful reign actually left Parthia in some confusion. As after the death of Alexander, parts of the empire began to break off. Specifically there was trouble in Armenia. What was the importance of Armenia, and what had been happening there up until now? Click to catch up. Mehrdad had thought he had Armenia sorted. Because of its geographical position (mountainous and remote), neither the Achaemenids nor the Seleucids had taken much interest in it. But even before Mehrdad was dead, the man he'd put on the throne, Tigranes, made a grab for independence, and soon won control of the Seleucid throne - and then headed for a slice of Parthian territory. Media, northern Mesopotamia, Cilicia and Seleucid possessions in Syria all fell easily to him. Cheekily, he even started calling himself King of Kings. Tigranes was backed by Mithridates VI of Pontus, who was involved in his own much more ambitious programme of expansion into Roman Asia and Greece from his territory on the southern shore of the Black Sea. The Romans had taken ten years to bring Mithridates to bay, but by 69 BC Lucullus was closing in on him. Two Parthian kings refused Mithridates' pleas for help: Lucullus had renewed the treaty. Parthia was still friends with Rome. Lucullus thought he'd finished with Pontus, and decided to pay a surprise visit to Tigranes, to show that it didn't pay to mess with the Romans. Tigranes panicked, abandoning the Mesopotamian city he'd named after himself, Tigranocerta. 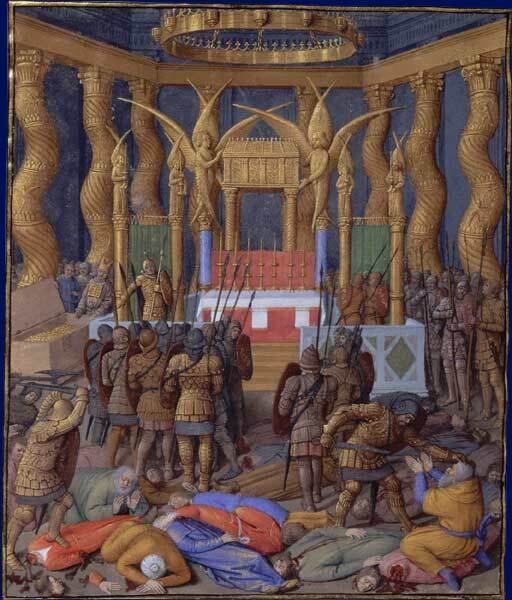 Lucullus laid siege although he only had 6000 men. Tigranes got some confidence back, when he realised he could still get his wives and even his money out of Tigranocerta despite the siege. He decided to confront Lucullus: a big error. Lucullus won easily, and a massacre followed. Tigranes in desperation looked around for help: naturally the Parthians were unenthusiastic. Mithridates VI of Pontus, however, ousted from his own territory, was delighted to join him. 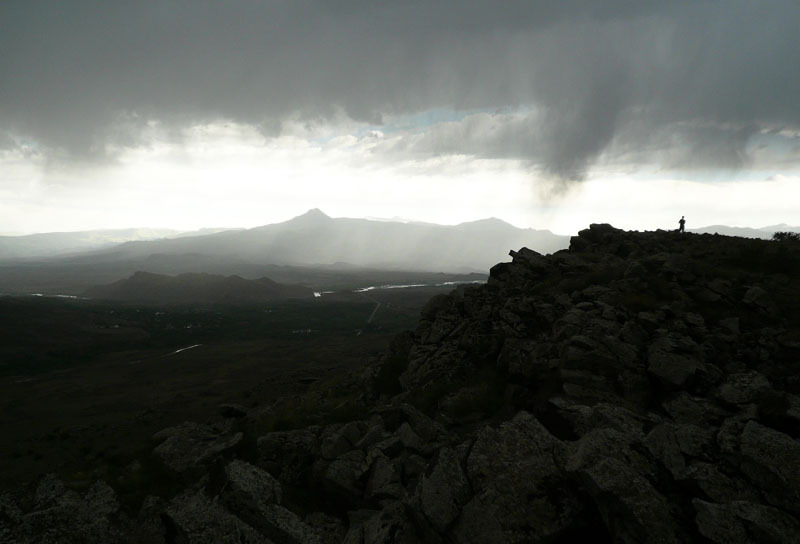 During the winter, Mithridates and Tigranes planned their fight back from the highland capital of Armenia, Artaxata. The morale of the Roman army was low, because of the terrain, the weather, Lucullus' harsh discipline, and political tensions. Now it was the Armenians who surprised Lucullus: and while Tigranes had him pinned down in Armenia, Mithridates made a bid to recover Pontus. A Roman army led by Lucullus' deputy was utterly annihilated by Mithridates in 67 BC. It seemed as if Mithridates would completely recover his empire, and that the Romans had wasted 10 years. Lucullus was a great general, but a hopeless leader of men: his unpopularity had contributed considerably to the failure of his campaign in Armenia and Pontus - and had also scotched his planned invasion of Parthia (if in fact he was planning to do so - violating his own treaty). After his defeat of Tigranes at Tigranocerta, Lucullus had agreed to recognise the Euphrates as the frontier with Parthia. The Parthian king (Farhad III) would otherwise perhaps have been tempted to join Tigranes and Mithridates. 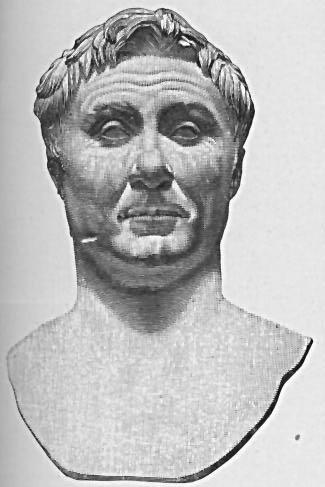 But in 66 BC Lucullus was replaced by the successful and popular Roman general Pompeius (Pompey). When Pompey offered him a deal, Farhad III accepted. Parthia was now an ally of Rome. Pompey advanced to confront Mithridates, but despite having the advantage, he couldn't stop him escaping into Armenia again. Armenia was now under attack by the Parthians, and Tigranes sent Mithridates packing. Farhad III had so far failed to take Artaxata, but Pompey soon arrived to take charge. Tigranes in a panic, scared by Pompey's reputation, surrendered to him. Pompey immediately made an alliance with Tigranes. He ordered Farhad to give back the territory he'd gained as part of the original deal, and sent troops to make sure he did so. Farhad protested. The Parthians never forgot how Pompey had cheated them. Suddenly, through no fault of theirs, the Parthians had become enemies of Rome. It was said that Pompey would invade Parthia - but there was trouble in Judaea which needed more urgent attention. Farhad attacked Tigranes again - this time as an enemy of Rome attacking a Roman ally. But the two kings soon realised they were playing into Rome's hands (the old principle of "divide and rule") - and made peace. "Invading Parthia" became a standard Roman ambition. Lucullus may have thought of doing it, Pompey wanted to do it, and finally Crassus did it. Julius Caesar was planning to do it, Mark Antony did it, and everyone was saying Augustus would do it. Parthia was never really a threat to Rome: but Rome became a real threat to Parthia. Various factors may have played a part: control of the highly profitable trade routes with the east - the Silk Route; "doing an Alexander" - a hero to the Romans as Pompey had already demonstrated; but the most likely explanation is the simplest. Roman generals led armies that swore loyalty to them personally, not to Rome (hence Lucullus' problems) - so they were free to lead their armies on a quest for personal glory and reward. The cash and prestige would then help build or revive political ambitions in Rome. Armenia plays a double game, as does the Roman commander Pompey - leading to Parthia becoming an enemy of Rome. For the earlier history and background to Armenia see here. 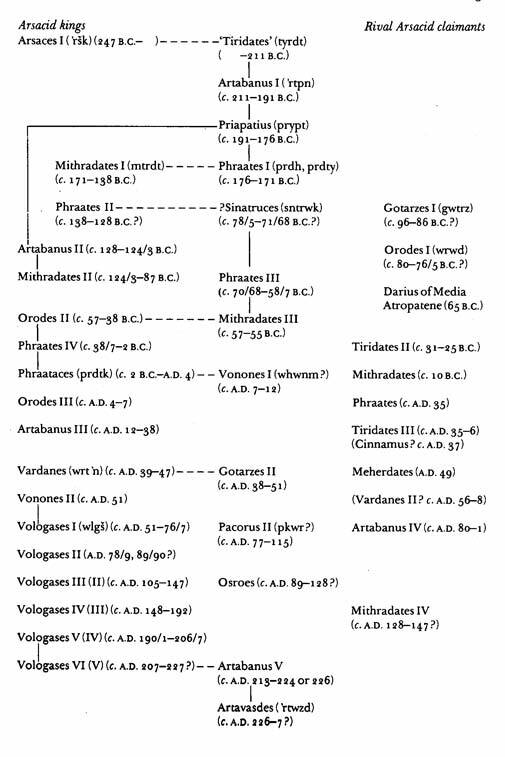 Key to The Arsacid dynasty (from Malcolm Colledge, Parthian Art). Dotted lines indicate succession between brothers (blood or adopted). Since the meeting with the Roman general Sulla in 92 BC. See previous page. Probably not far from Diyarbakir (Amida) in Sophene. He'd styled himself "the Great" (after Alexander) since winning victories as an 18 year old. Another Roman politician preferred to call him "adulescentulus carnifex" - the teenage butcher. Now he had the opportunity to win glory and massive wealth by finishing off Mithridates. He was wildly ambitious, and would have been a second Sulla or worse if he hadn't been competing with an even more ambitious Roman - Julius Caesar. He couldn't return to Pontus - instead he decided to raise a new army and invade Italy. The army, stirred up by a rebel son of Mithridates, was not so keen, however, and refused to take part. The rebel son was pardoned (big mistake), but continued to attack his father. Finally, in 63 BC, unable to escape from the castle in Panticapaeum (in the Crimea) where he was besieged, and dreading falling into his son's hands, he decided to poison himself. That didn't work, because "the poison king" was immune to its effects. He got a bodyguard to stab him. Although he was the most dangerous enemy Rome ever faced, he alienated those who could have been allies: both the Greeks and the Iranian peoples, as well as his own family. He was against Rome, but not for anything, except Mithridates. Because of its situation, squeezed between Ptolemy's Egypt and Seleucus' Syria, this tiny territory was always more important than its size would have indicated. (Ptolemy and Seleucus fought 5 wars over it.) It had been allowed to remain independent under its own Jewish kings since 110 BC, thanks to the weakness of the later Seleucids. But Pompey now, worried about Parthian interest, decided it was time to teach it a lesson. He exploited a quarrel between two Hasmonaean claimants to the throne, and invaded Judaea, storming the Temple in Jerusalem, but refraining from looting it. More here. Caesar had built up his power and cash with military success in Gaul (France) and Britain. Eventually he and Pompey slugged it out in a devastating civil war, which Caesar won.